Dubai, UAE, 6 December 2018: World renowned boxer Amir Khan is the proud owner of a new title which he will receive officially at a special event in Dubai next week. Khan has been installed as brand ambassador for Berkeley Assets, the private equity company which is now working on a range of new business opportunities. The former unified light-welterweight world champion has signed the deal with Omar Jackson, Partner of Berkeley Assets, and the partnership will be formally announced at a festive celebration taking place at the Jumeirah Beach Hotel on Wednesday 12 December. “I’m very pleased to be extending my partnership with Berkeley Assets, both in and outside the ring,” said Khan. Three months ago, Khan signed a multi-fight sponsorship agreement with Cryptech World, the blockchain technology company acquired by Berkeley Assets earlier this year. He marked the Cryptech partnership a few days later with a unanimous points decision over Colombian Samuel Vargas in Birmingham, UK and he is expected to announce his next bout soon. 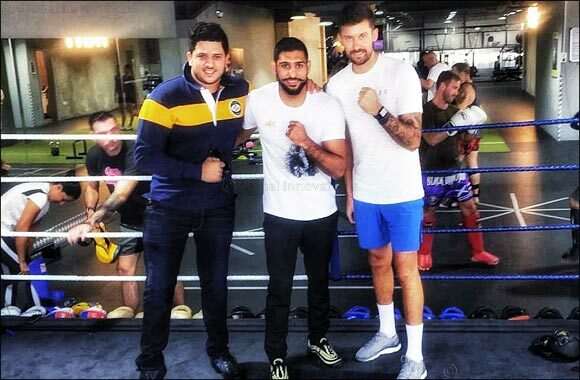 Khan, the former unified light-welterweight world champion who held the WBA (later Super) title from 2009 to 2012 and the IBF title in 2011, shared some boxing insights with Jackson and his own coach, Joe Ackary from BOXiQ on a recent trip to Dubai.